Workers trying to clean up the oil spill of June 25 in Loreto lacked the equipment to clean up safely. The oil spill threatens the vulnerable community of Barranca which lacks safe drinking water and electricity. Local residents and workers contracted to clean up a recent crude oil spill in Peru’s northeastern Loreto region lacked appropriate safety equipment, according to a preliminary report by the Dátem del Marañón Health Network, which is part of the Loreto Regional Health Office (DIRESA). Health risks could include “poisoning and burns” from direct exposure to the oil. According to the report, which was obtained by Mongabay, the oil spill reported on June 24 was caused by a crack at kilometer 213.4 of the Northern Peruvian Pipeline, which is operated by the state-run company Petroperú. 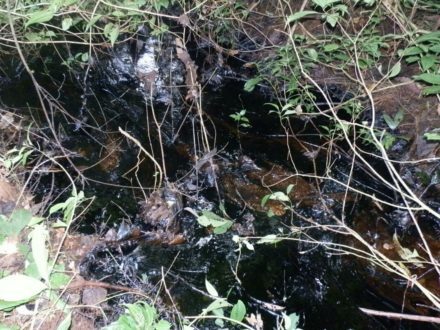 Two residents of the community of Estrella who were traveling to Barranca saw the spilled oil spreading from the pipeline and sounded the alarm, the report said. Community members informed local authorities, who named a group of people to investigate and contacted a local justice of the peace. Petroperú personnel arrived at the spill site at 10 p.m. and tried to contain the spill using makeshift barriers of leaves and branches, according to the report. “This did not help much, because the oil continued to leak and affect lower areas,” the report said. When they saw the damage, Petroperú workers ordered that the pumping of oil through the pipeline be stopped, according to the report. In press releases, Petroperú said that pumping had been suspended since February 16. The photographs shown here, which were provided to Mongabay by local residents who visited the spill site on June 26, show some of the damage. The community of Barranca, which is close to the spill site, is most directly threatened, according to the Health Network report. The community of about 725 people lacks basic services, such as safe drinking water and electricity, making it even more vulnerable. 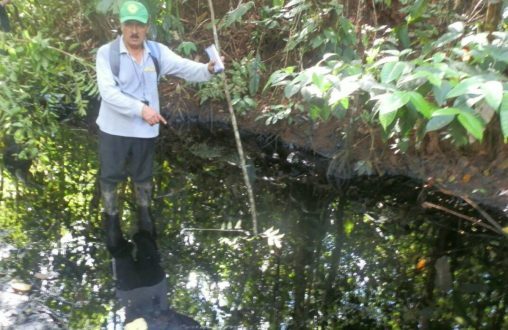 If the oil should reach the stream known as Barranca Caño, it would pose a serious risk, because the stream is the community’s main source of drinking water, according to the report. A local indigenous organization reported that the oil had reached the Marañón River, although Petroperú and local government officials said it had not. If the oil spilled into the Marañón, it would threaten the water supply of riverside communities downstream, putting more people at risk, the report said. The oil spill threatens to pollute water sources used by local communities. Photo by Barbara Fraser.